On Saturday, I went to the ALLERGY & FREE FROM SHOW at Olympia, the glass-domed exhibition hall in London. The ALLERGY & FREE FROM SHOW also shared the hall with LOVE NATURAL LOVE YOU and the JUST V SHOW. 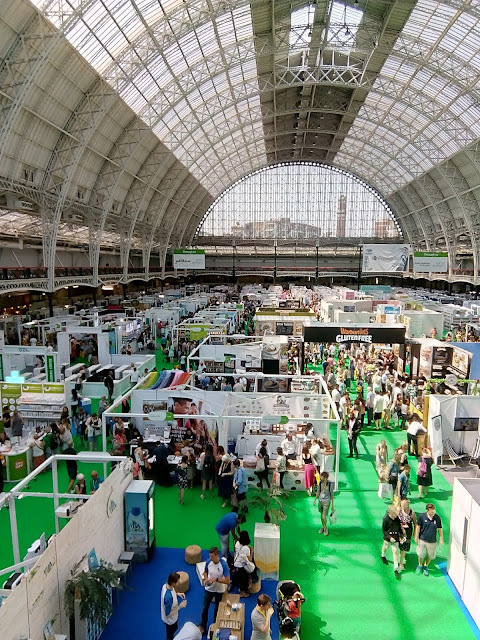 It was a wonderful event presenting food and drink, beauty and life-style products made from natural ingredients and/or free from certain things that people might wish to avoid. My first stop was the BLOGGERS MEET-UP hosted by Robbyn Snow from the ALLERGY & FREE FROM SHOW and Vicki Leeland, from LOVE NATURAL LOVE YOU. It was an opportunity to meet other bloggers and a few exhibitors who turned up with some samples of their products. PROMISE GLUTEN FREE gave me a Super Seed Loaf (gluten free, low sugar, high fibre, wheat free, dairy free) and offered me a taster of their yummy Chocolate Chip Brioche Rolls. I also received a gluten free Baguette (frozen to bake in the oven) from GENIUS. I have been enjoying eating both of these! Then, Robbyn and Vicki gave us each a "NATURAL HEALTH" shopping bag, containing a copy of the August 2018 "NATURAL HEALTH MAGAZINE", the INTERNATIONAL BEAUTY AWARDS 2018 Supplement, a lovely selection of beauty and skincare products and a few food and drink samples. As you can imagine, I will be trying out the beauty and skincare products during the summer, so keep posted for my reviews! As always, the show offered a display of so many products - something for everyone I would say - but each year I usually focus on a theme. This time it was sensitive skin and suitable skincare. 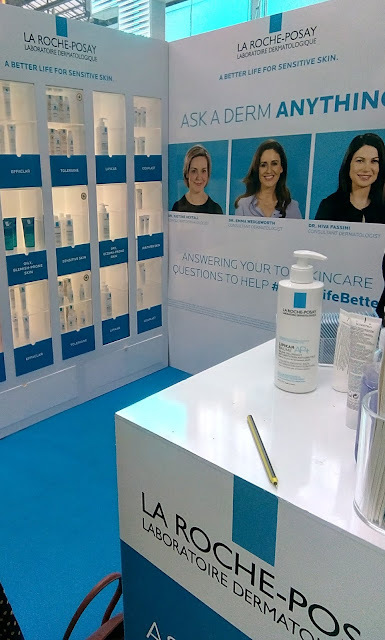 After the talk, I looked at the nearby LA ROCHE-POSAY stand, where they were promoting their TOLERIANE ULTRA, a daily moisturiser that they claim relieves sensitive skin and helps to reduce redness. I took a couple of the small samples that were offered to visitors and intend to test and review the moisturiser. Their range of products also includes a 50+SPF sunscreen for sensitive skin, ANTHELIOS XL ULTRA-LIGHT and a variety of cleansers. I thought that TOLERIANE DERMA-CLEANSER, a cleanser & make-up removal fluid for intolerant skin, sounded interesting. LA ROCHE-POSAY skincare products are easily available at BOOTS, where currently they have some special sale prices on this brand. Normal prices for these products are within £12-£20 - not the cheapest on the market, but not the most expensive!